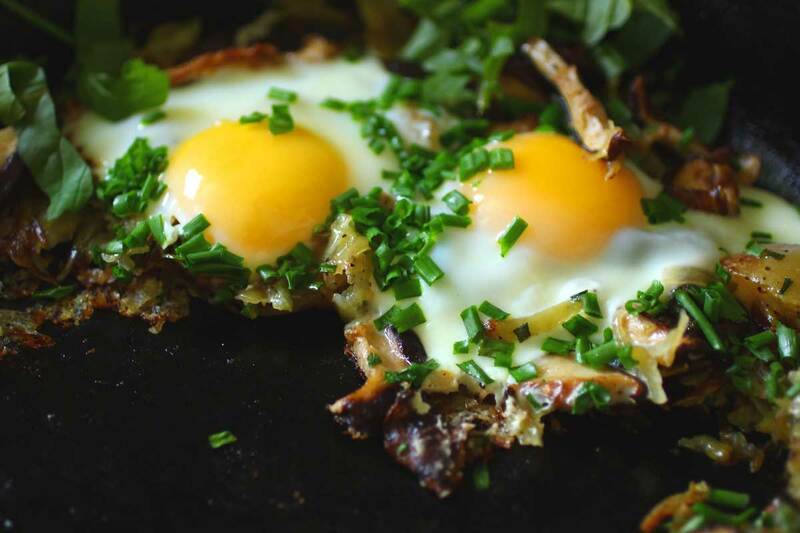 Crispy hash browns and buttery shiitake mushrooms layered with fresh chives for a burst of green and soft onion flavor. The eggs are cooked on top so that the whites sneak into the crevices and just begin to crisp. Add some hot sauce and arugula for a one pan meal that fills you up without weighing you down. If you follow this blog you might have picked up on some food themes. Cast iron—I love my cast iron, much like my sourdough starter, I subject my cast iron pans to far more abuse than I’m supposed to, washing them with hot water and soap if I need to (just re-season with a quick coat of oil afterwards). My bread still rises and my cast iron skillets rarely stick. Eggs—an egg on top is not a trend for me. I come by this naturally from both sides of the family tree. Mushrooms—what can I say? They satiate. I feel satisfied when I eat a meal with mushrooms. I’ve had hash browns on the brain for days now. These would have been better if I’d had a little notice and some russet potatoes but were still tasty. Tasty enough that there are more shredded potatoes coming soon. Even easier use frozen hash browns. Wrap the potatoes in a kitchen towel or cheese cloth and squeeze out all the moisture you can into a medium microwave safe bowl, reserve the liquid and allow the starch to settle to the bottom, pour out the liquid and add the potatoes to the bowl. I usually microwave my potatoes for a couple of minutes to start them cooking and release a bit more moisture- you could skip this step if you don’t have a microwave but the potatoes will be a bit denser and a bit starchier. Meanwhile in a dry cast iron skillet preheated over a medium low heat add the mushrooms and cook until they just begin to brown and release their juices. Add a bit of your choice of oil (olive oil, bacon fat, and butter would all work here) and add the potatoes, distributing evenly in the pan, sprinkle with a dash of salt and black pepper. Cook without disturbing until bottom is golden brown (about 5 minutes). Flip the potatoes and cook until light golden brown then add the mushroom, lightly combine the mushrooms with the hash browns, add about half the chives and then the eggs. Cook over low to medium low until the whites are set and the yolks are to your liking. 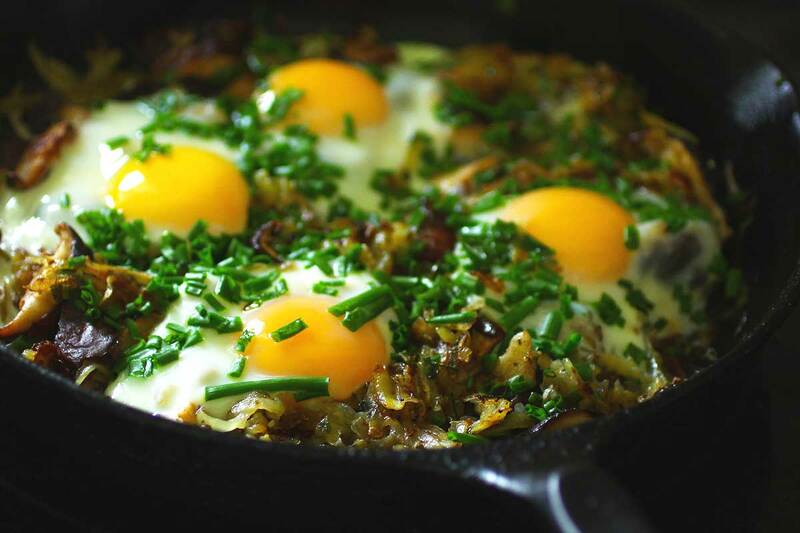 Covering the pan will speed the process but increase the chances of the yolks cooking through. Top with more chives and arugula and serve. YUM. This sounds too good.. if I could have this for breakfast every morning I would be one happy person! This looks FANTASTIC!!!! I could definitely have this weekly on the weekend. The photos are amazing; the yolks are calling my name right ABOUT NOW. P.S. Did you change the layout/graphic on your blog? I Love Love Love this new look. Thanks Pang! Yes I did do a little layout tweaking. I finally got the logo/graphic I wanted cleaned up and into digital format (ostensibly to do a podcast) so I’ve been sticking it everywhere I can. I’m so happy you noticed and like!